Here you can see one of panels to my mock up of my upcoming film, “Frosty Versus Zorro.” I don’t have the full story developed yet. I haven’t decided whether the snowman goes to Mexico or the sword fighter goes to Vermont. Plus, I haven’t quite figured out out how to draw it out long enough. Our masked cape wearer has the upper hand with the steel, obviously. And Frosty lost his broom so he can hardly fight back. Ah well. Chalk one up for the man in black. 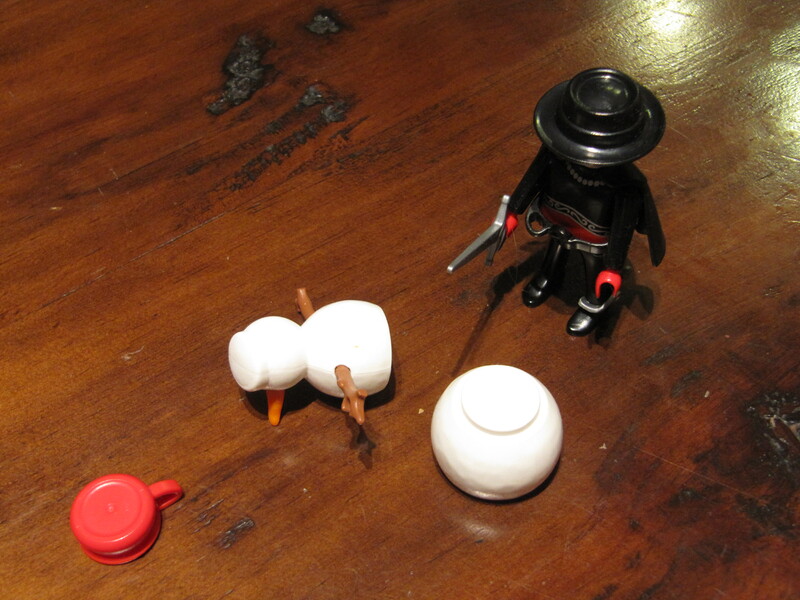 This entry was posted in art, fun and tagged fighter, Mexico, movie, Playmobil, snowman, sword, Vermont, Zorro. Bookmark the permalink.